You need to know how the consumer thinks and how they respond to a need. PLEASE ALWAYS REMEMBER… People DO NOT respond to ads, they Respond to their own Needs. The Buying Funnel explains how that process takes place. Stage one of the buying funnel is AWARENESS. Just in the area that 580 WIBW-AM and 94.5 Country covers we have over half a million consumers. Do they know about you? What do they know? People can be made aware of your brand with or without the desire to purchase. Awareness can be based on a communications message, advertising, or independent discovery. Awareness happens when the customer is aware of the existence of a product or service. What happens when they all the sudden need or are starting the search for your type of product or service? For example…you don’t need a plumber right now. BUT you wake up tomorrow morning with a basement full of water. Now what? You search your memory and come up with a couple names. You are “Aware” of these plumbers from advertising that you never paid attention to before because you didn’t need a plumber. That is where your search starts. And if you are a plumber you better hope you are one of those two or three names in people’s subconscious when they need you! 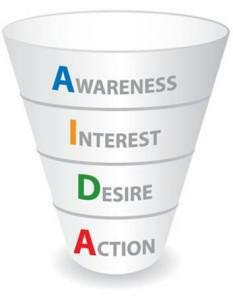 That is where the buying funnel starts…Awareness stemming from consistent marketing. No matter what kind of business you have. At this point, the potential customer has decided they want or need a product similar to yours. They are likely to start reading reviews, making comparisons, asking opinions, and researching their options in detail. If they are aware of you, you will be in the hunt. And if you are telling them what they need to know in your advertising, you will move up the list quickly. This is the step in the consumers buying process, where they are aspiring to a particular brand or product. This step is the next progression from the Interest stage. The person moves from a “nice to have” mentality to a “must have” mentality. This is where your Top of Mind awareness will pay off. They want the product or service and they are ready to take the step to commitment. This is when they start looking for that business that they are familiar with and feel they can trust. This is true for every type of purchase from what kind of gum they will buy to who they will have to help them plan their financial future. The more they know about you and what you offer the better your chances are for being involved in their next step! Ok, the customer is convinced and is ready to part with their hard-earned cash. This is the final stage we have been waiting for! We have put our message out there! They became aware of who we are and what we offer. They understood what our product or service could do for them. Eventually, they had a need or desire for what you offer. They trusted you and feel that you are the company that will provide what they want. NOW…they come in to take action and make that purchase! How did we get here? Consistency! Determination! Advertising! You put a great message out there. You kept it going. You didn’t give up or chicken out. Now what? You’ve converted that particular customer…so now you keep it up and convert the next one…and the next one…and the next one! That’s how advertising works. Read my Ten Reasons to Advertise and Questions to Ask Yourself posts for some great steps to take before you advertise! 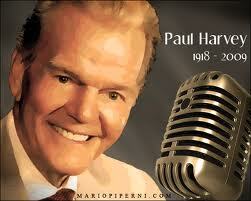 Click his image above to see What Paul Harvey has to say about advertising! How long are people thinking about what you sell before they buy it from you…or your competitor?